Creative Edge Master Shop in Fairfield has been awarded a $110,000 low-interest loan from the Regional Economic Development Incorporated (R.E.D.I) Revolving Loan Fund to assist in expanding their operations. The R.E.D.I. Revolving Loan Fund is intended to be coupled with traditional financing or other Revolving Loan Funds. The loan funds will be used to purchase additional Waterjet Technology Machines and to upgrade existing equipment. The planned expansion has immediately created 10 new advanced manufacturing jobs in the firms ToolKeepers Division which manufactures high performance industrial foam tool kits. The new jobs will include adding an additional programming engineer, a machinist and production positions. 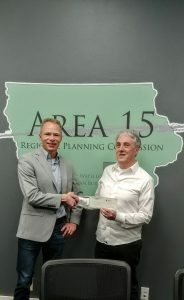 President of Creative Edge, Jim Belilove, worked with Fairfield Economic Development Association in applying for the loan which is administered by Area 15 Regional Planning Commission. “The REDI Revolving Loan Fund has been an important ally in the expansion of Creative Edge and has made possible several expansions over the years. This project will add high-tech equipment and productive capacity to fuel the growth in the ToolKeepers Division” according to Belilove. “The expansion of operations and the 10 new advanced manufacturing jobs is exciting news for Creative Edge and for Fairfield. Creative Edge has been a foundational employer in the community and they understand innovation is important, this is why they are seeing this growth” says, Joshua Laraby, Executive Director for Fairfield Economic Development Association. In addition to Creative Edge’s ToolKeepers Division, they also have a hard surfaces flooring and soft surfaces flooring division that also utilizes Waterjet Technology. The company has a 30-year global footprint with installations around the world. Jefferson County businesses interested in more information on the R.E.D.I Revolving Loan Fund and opportunities to finance projects should contact Joshua Laraby, Executive Director for Fairfield Economic Development Association.